Yosemite National Park represents a contradiction to me. A place entirely about nature, but it’s crawling with hordes of chattering tourists and hiking trails are paved. 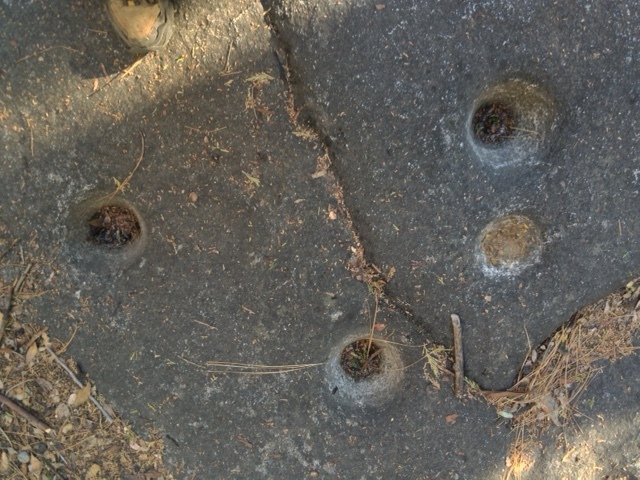 There is something oddly and strikingly askew about sections of the John Muir Trail being asphalted over. That seems more appropriate for a footpath dedicated to an industrialist like John D. Rockefeller, co-founder of Standard Oil, rather than naturalist Muir, founder of Sierra Club. The hardscape immediately and irrevocably alters the ambiance of the trail making the setting feel less natural and wild, and more like an extension of the metropolis. The tentacles of humanity twisting their way deep into the woods to further claim them for urbanity. Junior pathways, “the very tip of the monster’s tentacle,” linking to the byways of “industrial tourism,” as Edward Abbey wrote. Sidewalks and paved roads are unmistakably metropolitan. They are the capillaries and arteries of city life and that which connects and binds those urban organs of modern human existence together. Found in the woods, they refuse to let go of nature and allow it to be wild, but rather keep it tied to the sort of artificial human sphere I seek to escape when venturing into the wilderness. Such hardscape makes the forest feel like a park, which of course it is, a National Park. 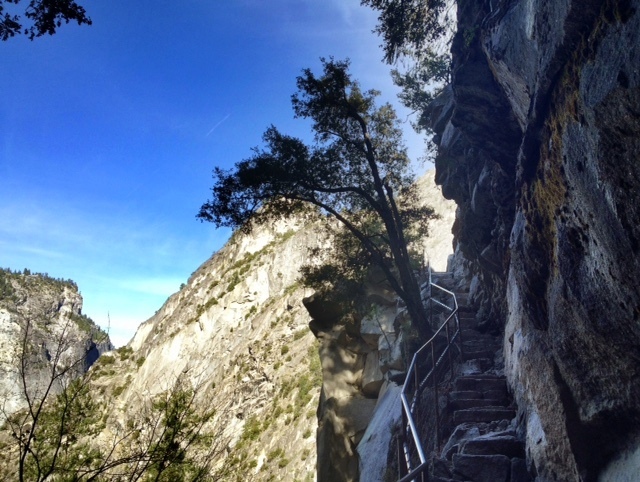 Paved paths, hordes of people ambling around at every notable sight, metal hand railings and fencing and signs make my Yosemite experience feel more like a visit to a museum rather than a hike into the natural world. Perhaps Yosemite is indeed a museum piece of a sort, but hopefully our industrial society will never render it a mere tag-end of what once was. I suppose these characteristics are inevitably unavoidable in a majestic place like Yosemite wherein millions of people visit annually. I can offer no reasonable alternatives to development when the park faces the annual onslaught of eight million human feet excitedly trampling about. 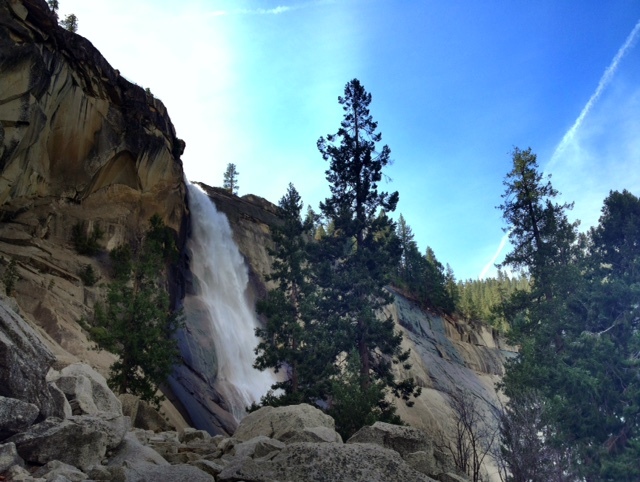 John Muir Trail at Vernal Falls. 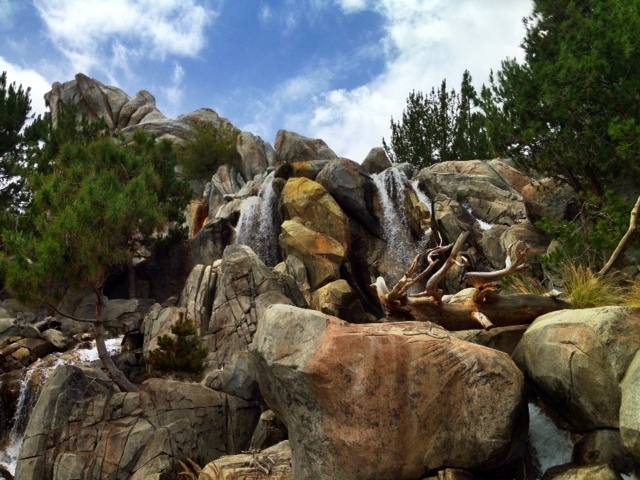 Faux falls on “Splash Mountain,” Disneyland. Aside from being a museum showcasing our national inheritance, sometimes Yosemite feels something akin to a gargantuan theme park like Disneyland. When I think, dream, of having the magical power to create a natural wonderland it’s hard to imagine topping Yosemite, for it has nearly all the facets of a wild gem I could think of ever wanting; awesome granite peaks, raging waterfalls blasting off mountain precipices, serene stretches of crystal clear river and tall conifer forests humming with the silence of wildness. Even were I to top Yosemite in this hypothetical game, the park would be the blueprint of inspiration to begin with. 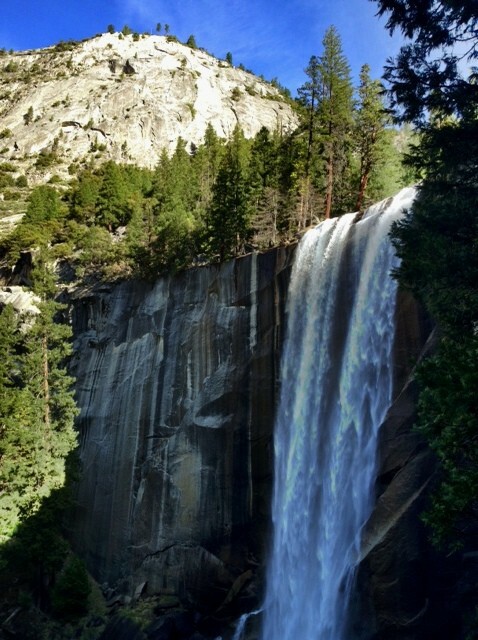 Yosemite is the quintessence of nature so dearly valued by lovers of wilderness and even those less inclined to value forest can’t help but be awed. It is a blueprint for the building of replicas of nature as found in places like Disneyland and urban parks. In these artificial places the natural world is imitated and reflected, but also natural places like Yosemite come to reflect those artificial creations. Sometimes hiking the trail, amid the jostling crowds and signs and fences and railings, thoughts flash through my mind, that it’s as if the land before me of Yosemite has all been built, a theme park or the false facade front in a movie set of a spaghetti western. Emerald Pool above Vernal Falls. 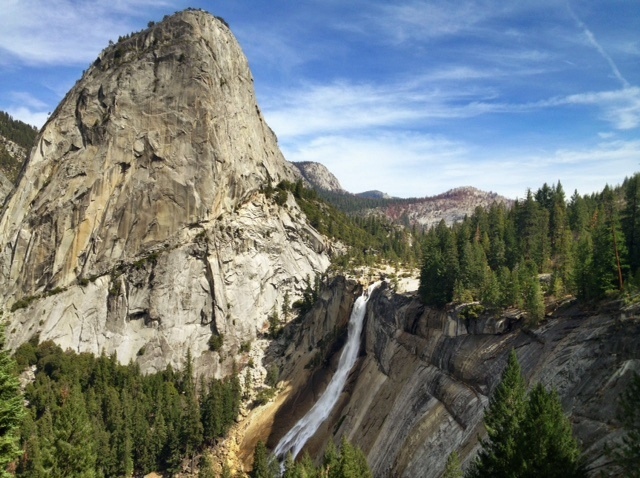 Liberty Cap and Nevada Falls. 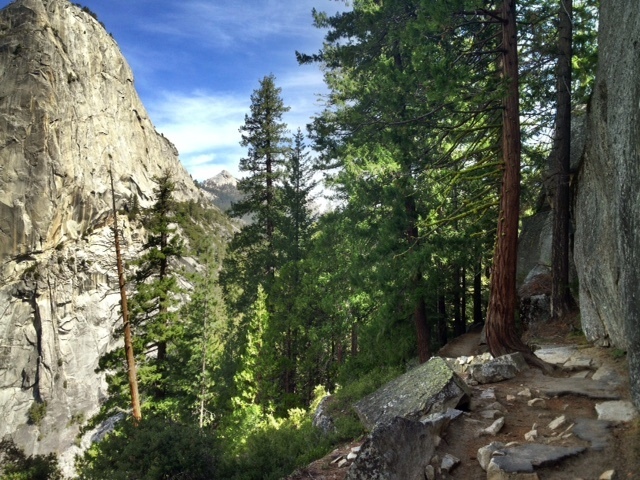 John Muir Trail and Liberty Cap. Ten years old was about the age I was when I first visited Yosemite. I had visited the park several times in subsequent years and on each visit we always camped. Not RV-style luxury camping, we always lived for the few days or week long trip down in the dirt and sleeping in tents. Roughing it, as they say. This last March I stayed in a hotel for the first time. We booked a weekend in the prestigious and historic Ahwahnee originally built in 1927 and located on the valley floor of Yosemite. Our brief stay was like no other experience I have ever had. In the morning I would wake, ready myself and gear, walk down stairs to the second floor to get a cup of exceptionally good complimentary coffee and proceed to walk out the door into the conifer forest and onto a hiking trail within just minutes of filling my cup. I’d be on the trail walking toward my destination for the day with my cup full of coffee still steaming. Within minutes, by foot, I’d go from the warm, plush comfort of my bed and onto a trail that offered as many miles as I could physically and mentally bear to walk of some of the best hiking in the Unites States of America. I could, in point of fact, walk out the Ahwahnee, onto the Pacific Crest Trail, and all the way to Mexico or Canada by foot. At day’s end, fatigued, dirty, smelly, hungry, ragged looking, I’d stagger back into the hotel to a hot shower, a cocktail or two at the bar, followed by an exquisite meal in the grand Ahwahnee Dining Room with Mrs. Elliott, and afterward a plush bed with a stack of books to read for the evening. Looking from the other side at Nevada Falls. It was a revolutionary trip. The luxury completely redefined in my mind what a visit to Yosemite is all about or, perhaps better stated, can be about should one desire it. Staying in a hotel and camping in tents are alternatives to each other and not substitutes. Each offers opportunities for far different experiences, all of which hold their own particular value. In enjoying the luxe convenience I shouldn’t niggle about Yosemite seeming at times to be more of a museum or theme park rather than pristine, untrammeled and undeveloped nature. In fact, now that I’ve tasted of the sumptuousness of such forest recreation I’m forever spoiled. I’ve gone soft. We’ve got plans booked for another trip come spring. I’m sure I won’t miss any of the dusty campsites nearby a lick. I might even shuffle through the jostling crowds with a wee bit more tolerance. Maybe. 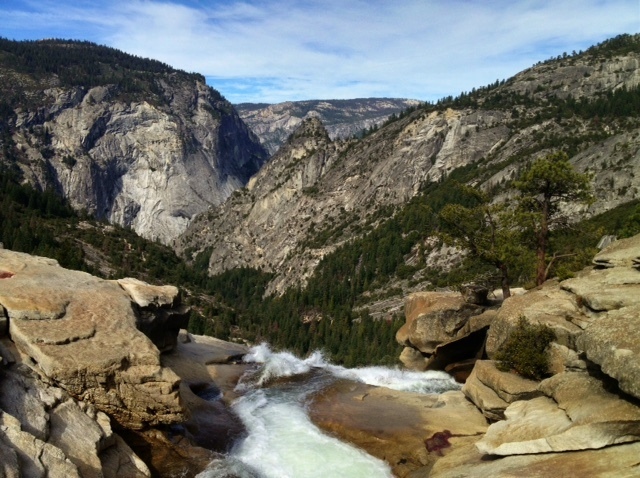 View from top of Nevada Falls. This entry was posted in National Parks and tagged Archaeology, Hiking, Hiking (2), iPhoneography, National Parks, Nature, Pics, Wilderness, Writing, Yosemite. Bookmark the permalink. We’ve had to ‘stone-pitch’ a lot of our more popular mountain paths as the erosion was getting too wide – that keeps the path to a set width. We don’t do railings and stuff though and I don’t like to see them much either. Jack, I share your sentiments; nice article. I can no longer tolerate the congestion nor hordes of tourists during the summer months. 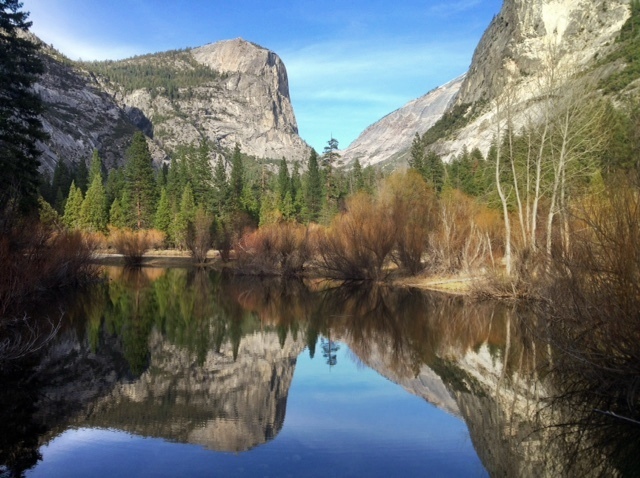 But like a magnet, Yosemite beckons, so I visit the Park during off seasons, typically during the winder and fall months when it is quieter and the trails are less crowded. 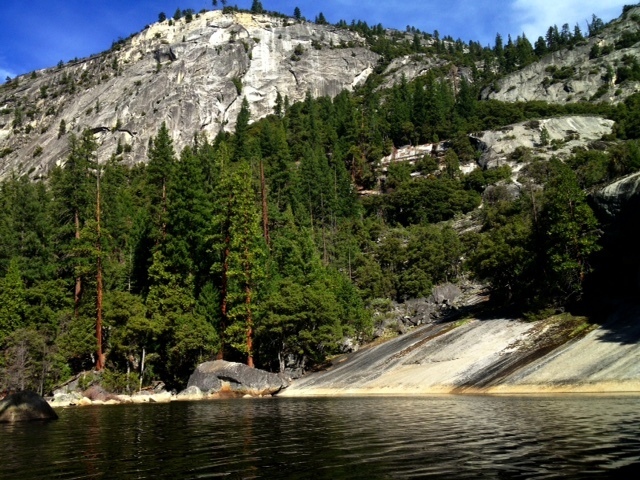 It is during these time the magic returns and it feels like Yosemite of old and I feel at one with nature. Hard to beat.